It’s actually even a cliché just to say it, but some things really are “cliché for a reason.” And as much as I try to avoid the cliché shots in Yosemite, sometimes they just can’t be helped. My Yosemite Fall Color workshop began yesterday, and even though I’d spent all day Saturday in the park, yesterday morning a storm filled Saturday’s blue skies with rain and I felt like I should go check on the conditions before we started. The wet weather had slowed me enough that I didn’t really have time to take pictures, but when I found not only the red and yellow leaves I’d seen on Saturday, and the swirling clouds I’d hoped for, but also Yosemite Valley’s colorful trees and meadows etched with snow, I was tempted at every turn to reach for my camera. Nevertheless, with the exception of a brief breakdown at Cook’s Meadow, I managed to resist temptation. Unfortunately, the Cook’s Meadow stop had put me even more behind schedule, so I told myself while approaching Valley View that any stop here would be just reconnaissance. And anyway, Valley View images are a dime a dozen, clichés that I’d done more than my share to perpetuate over the years. Then I got there…. I mean seriously, cliché or not (deadline or not), how does a photographer pass up a scene like this? With my group meeting me in just an hour, I really, really didn’t have time for pictures, which is exactly what I kept reminding myself as I leaped from my car, snatched my camera and tripod, and sprinted down to the river. I only snapped four frames, two vertical and two horizontal, before racing back to the car and toward my impending rendezvous. It’s images like this that remind me that nature’s beauty transcends any human judgement of “cliché.” Pro photographers, myself included, can get a little snobbish about frequently photographed scenes. And while I think it’s important to take the time to find a unique perspective, sometimes it’s best to let Mother Nature speak for herself. I made it to my workshop with minutes to spare, conducted a lightning-fast orientation, and hustled everyone back outside as quickly as possible. We ended up circling Yosemite Valley several times, photographing without a break until dark. I heard no complaints. Some things you just can’t plan. But if you have experienced the disappointment that comes when preparation, sacrifice, and extreme discomfort end in complete failure, yet have still gone back out the next time and the next time and the next time, Mother Nature will sometimes reward you with gifts of exquisite beauty. More than the successful shot that was planned and executed to perfection, it’s these gifts that keep me going back out with my camera when I’d so much rather be at the dinner table, curled in bed, or reading by the fire. I’ve had a few of these unexpected blessings in my photographic career: Half Dome emerging from a churning caldron of clouds, barely visible in the very last light of day; a persistent double rainbow arcing above the full breadth of Yosemite Valley; the Milky Way, framed by glowing clouds, pouring into Kilauea Caldera; and most recently, a magic morning at the Grand Canyon, when the lightning wouldn’t stop and the first rays of sunrise balanced a vivid rainbow on the canyon’s rim. 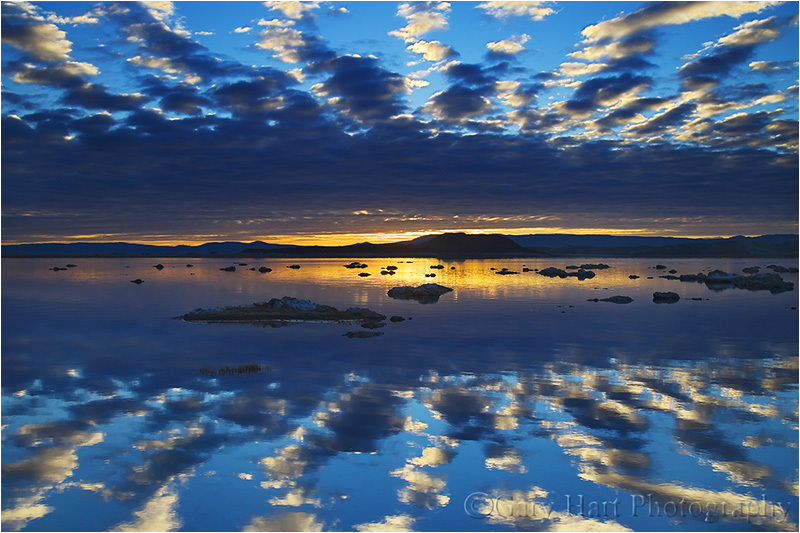 Another of those moments was this sunrise at Mono Lake. It was the final day of a trip with my brother to photograph fall color in the Eastern Sierra. Facing a long drive home, and despite a weather report promising clear skies, we rose in the dark and went out in the October chill anyway. That I’ve been able photograph these moments with my camera is my great fortune. But with or without my camera, every detail of being there is permanently etched in my memory—not just the visual, but who I was with, where I might have been instead, and the joy of feeling like I’m witnessing the most beautiful thing happening on Earth at this moment. It’s these permanent, visceral memories that drive me from bed, warm my flesh, and calm my angry stomach when thoughts of comfort try to keep me home. It seems that people stay away from Yosemite in autumn because that’s when the waterfalls are at their lowest. True story. But believe it or not, Yosemite isn’t all about waterfalls. El Capitan, Half Dome, Cathedral Rocks, Sentinel Rock (I could go on), are great subjects in their own right. Subtract the waterfalls but add the yellows, oranges, and reds of Yosemite Valley’s many deciduous trees and you have what I think is a pretty a fair trade. And when the water is low, the usually turbulent Merced River smooths to a reflecting ribbon of glass and suddenly, pretty much any scene can be doubled at your feet. These reflections add layers of creative possibilities impossible the rest of the year. Sometimes I’ll split the scene in the middle for a 50/50 mirror effect; other times I’ll photograph only the reflection. In the image above I went with a more conventional composition, emphasizing El Capitan’s bulk against clouds that were spitting small, wet snowflakes. In this image I split the frame 50/50, but dialed down the reflection with my polarizer. Even polarized, the bright sky’s glare washed out much of the river surface, painting the outline of El Capitan like a negative that uses the trees with a jigsaw of submerged river rocks. Here I used El Capitan’s reflection as a background for the Merced’s brilliant autumn veneer. 2015 Yosemite Autumn Moon workshop. The key to successful sunrise photography is arriving early. How early? My rule of thumb is, if you can navigate without a flashlight, you’re too late. I know, I know, you’re sleepy and it’s cold, but it shouldn’t take more than one or two mad sprints beneath crimson skies to get you to pull back those covers just a few minutes earlier. And guess what—when you arrive early enough to savor the sunrise rather than rush through it, you’ll soon recognize a purity of air, sound, and light that just can’t be found at any other time of day. 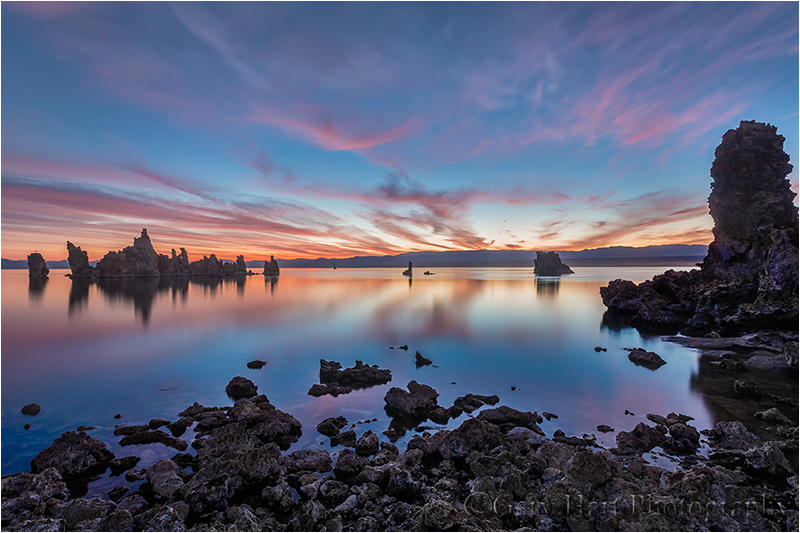 At popular spots like Mono Lake, arriving at least forty-five minutes before sunrise has the added advantage of beating most of the people with whom you’ll be competing for choice real estate. The air here is often graveyard-still this early, the lake a perfect mirror. While the landscape is dark to my eyes, a gold-blue band on the horizon hints at the approaching day, and I know it’s not too early for long exposures that will reveal color and detail my eyes can’t see yet. The image here was captured about a week and a half ago, on the penultimate sunrise of this year’s Eastern Sierra photo workshop, over 40 minutes before sunrise. Experience has shown me that people don’t always realize how well today’s digital SLR cameras perform in low light; when it’s this dark I sometimes need to prod workshop students to start shooting. Often the best way to do that is to fire off a couple of frames of my own to show them what’s there. It was dark enough that stars were visible overhead (take a look at the exposure settings to get an idea of how dark it was). I spot-metered the brightest part of the sky, dialing in an exposure that was two stops above a middle tone—just bright enough to bring out foreground detail without washing out the color in the sky. My “rule” (I hate that word) for the horizon is to place it relative to the aesthetic appeal of the foreground versus the sky: If the sky is a lot better than the foreground, the sky gets most of the frame; if the foreground is a lot better than the sky, the majority of the frame goes to the foreground; when it’s a tossup, the horizon line goes in the middle. This was just the beginning of what turned out to be an amazing sunrise, the kind a workshop leader prays he can give his group. By the time it was over everyone had shots facing east, north, and west. About fifteen minutes after I took this the sky turned an impossible crimson that reflected in the lake, making it appear to be on fire. I have images of that too, but there’s just something about the tranquility of these earliest images that really resonates with me. What is it about reflections? I don’t know about you, but I absolutely love them–I love photographing them, and I love just watching them. Like a good metaphor in writing, a reflection is an indirect representation that can be more powerful than its literal counterpart. In that regard, part of a reflection’s tug is its ability to engage the brain in different ways than we’re accustomed: Rather than processing the scene directly, we first must mentally reassemble the reverse world of a reflection, and in the process perhaps see the scene a little differently. Because a camera renders our dynamic world in a static medium, water’s universal familiarity makes it a powerful tool for photographers. We blur or freeze in space a plummeting waterfall to convey a sense of motion that conjures auditory memories of moving water. Conversely, the mere image of a mountain reflecting in a lake can convey stillness and engender the peace and tranquility of standing on the lakeshore. This El Capitan winter reflection is another from last month’s Yosemite winter workshop. Arriving at Tunnel View before sunrise, we found a world covered in snow and smothered by clouds. But as daylight rose, the clouds parted and we were treated to a classic Yosemite Valley clearing storm scene. 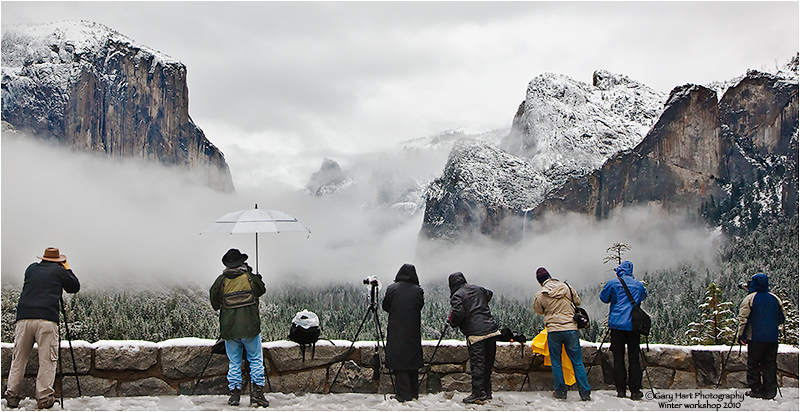 The photography was still great when I herded everyone away from Tunnel View so we’d have time to capture as much ephemeral grandeur as possible in the limited time before the snow disappeared. I tell my groups that, while the photography is still great where we are, it’s great elsewhere too. This approach ensure that not only does everyone get beautiful images, they get a variety of beautiful images. El Capitan Bridge was our second stop after Tunnel View. El Capitan is so large and close here that capturing it and its reflection in a single frame is impossible without a fisheye lens, or stitching multiple images. But sometimes the desire to capture everything the eye sees introduces distractions. Feeling a bit rushed, I inhaled and forced myself to slow down and simply absorbed moment, soon realizing that it was the reflection that moved me most. I attached my 17-40 and tried fairly wide vertical and horizontal compositions that highlighted the best parts of the scene, twisting my polarizer in search of an orientation that captured the the reflection while still revealing the interesting world beneath the surface. Of the dozen or so frames that resulted, this may be my favorite for the way it conveys everything in those few sunlit, snowy minutes when the world seemed silent and pure. A note to you skeptics: I’m asked from time-to-time why the trees are white, while their reflection is green. This actually makes perfect sense once you realize that you’re looking at the top of the snow-covered branches, while the reflection is of the underside of the branches, which are not covered with snow. One of the risks of making photography your livelihood is the possibility (likelihood?) that the business will preempt the photography. Even though I’ve consciously chosen to continue photographing only what I want to photograph without concern for the marketability of an image, when I return from a trip the demands of the business often leave little time for my captures. A few days ago I received a request for an image that sent me digging through my archives. I found what I was looking for, but in the process stumbled upon a few images I’d forgotten about; probably nothing that will make me rich, but at the very least some that make me happy. This got me thinking that every photographer might benefit from occasionally revisiting rejected captures. Often our first impression, influenced by the mood of the moment, is entirely different from our current impression. You’ve no doubt grown as a photographer, re-defined your tastes, refined your eye, improved your processing skills–all factors that might lead to different conclusions about past rejects. The next time you find yourself in a photography state of mind, and the bright sun and blue sky outside offer little promise, try returning to past captures. If an image stops you, open it and play a bit. Correct flaws, experiment with different crops, sharpen–whatever you think it might need. Who knows, you may just find yourself pleasantly surprised by what’s there. Today’s image is one such find. 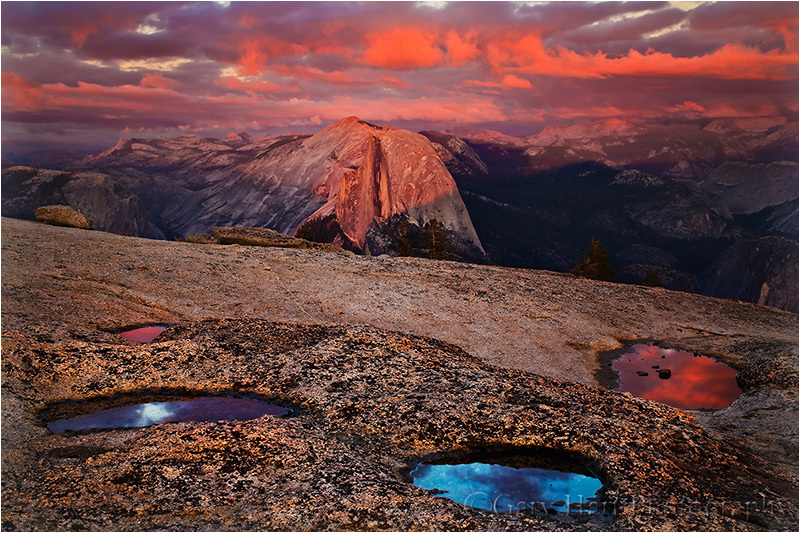 As a Yosemite photo destination, Valley View is probably second only to Tunnel View in popularity. I take all my workshop groups to Valley View, and usually can’t resist a peek when I’m in the park on my own, but rarely photograph there anymore. But on a visit a couple of autumns ago, finding the light and clouds irresistible, I set out to see if I could create something I didn’t have. 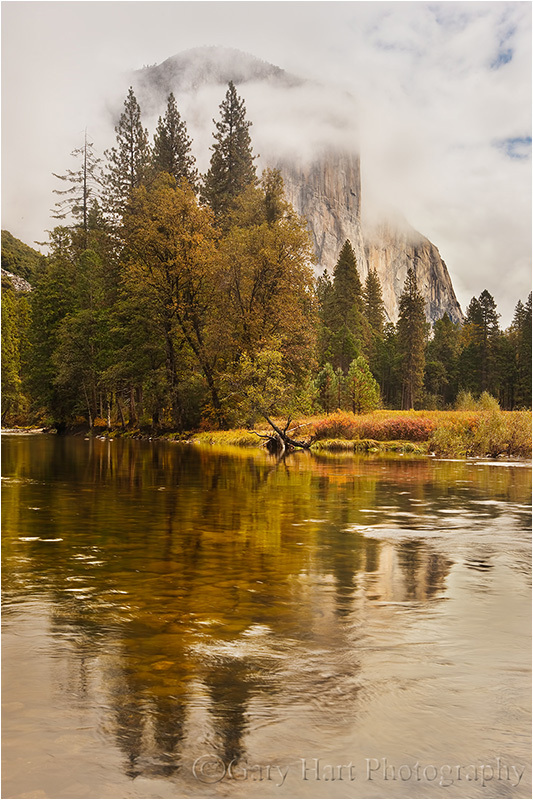 With the clouds enshrouding El Capitan lending an air of mystery, I chose a vertical composition to eliminate less compelling surroundings. Rather than emphasize the almost irresistible reflection in the meandering Merced, I adjusted my polarizer to reveal the river-rounded rocks beneath the surface. The result was a high-key perimeter framing the darker scene that gives the frame a negative feel, where the darkest regions do the most work. Despite liking it as soon as it flashed in my LCD, I thought little more about this image until I stumbled upon it last week. While this won’t likely be the image I retire on, at the very least it nudged me into digging a little deeper on my hard drives to see what else might be out there. Stay tuned….